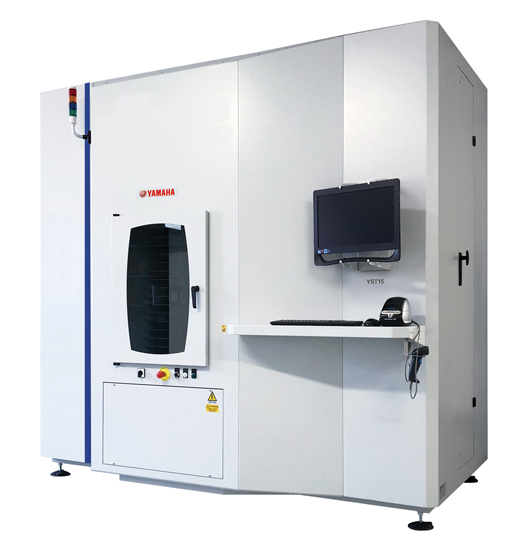 Labor Saving in Device Supply to Surface Mounting Processes, Yamaha Motor Launches YST15 Intelligent SMD Storage System, Can Manage a Maximum of 1,500 and Batch Load/Unload 27 Reels - News Releases | Yamaha Motor Co., Ltd.
IWATA, May 28, 2018—Yamaha Motor Co., Ltd. (Tokyo:7272) announced today that it will launch the new YST15 Intelligent SMD Storage System on October 1, 2018. The YST15 interlinks with mounting lines to automatically store and manage supply of Surface Mount Devices (SMDs). Capable of storing up to 1,500 reels (for the 7-inch 8mm format), the YST15 storage system can also load or unload a maximum of 27 reels in one batch. Through interlinking with a mounting line controlled by the Intelligent Factory IoT/M2M integration system, which enables centralized management of electronic component mounting processes, mount devices requiring supply can be automatically extracted in advance from inventory at the optimal timing and supplied in batches. This advance enables significant reductions in staff workload and prevention of production interruptions due to delays in device supply. In addition, the optional humidity management function provides storage appropriate for electronic components which require a humidity control. A wide range of advances are being made in automation and smart technology in surface mounting processes which demand high quality and efficiency, but many aspects of supply, transport, and inventory management of mount devices are still carried out manually and require a large labor workload. In order to save labor in mounting process component supply work, Yamaha Motor has previously provided products such as the Auto Loading Feeder (which enables simple supply of mount devices without stopping an operating machine), the sATS30NS Auto Tray Sequencer (ATS) for nonstop tray replacement, and the nonstop feeder carriage exchange system. The new YST15 links with surface mounters and labor-saving devices, and in the future, through components being automatically transported by Automatic Guided Vehicles (AGVs), will comprehensively increase the production efficiency of the overall mounting process. The YST15 will be exhibited at “SMT Hybrid Packaging 2018,” the largest micro electronics trade fair in Europe, to be held from June 5 to 7 in Nuremberg, Germany, and also at the JISSO PROTEC 2018 specialist mounting technology trade show, to be held from June 6 to 8 at the Tokyo Big Sight (Koto-ku, Tokyo).